Beauty trolley carts are a must for salons and spas. Each trolley is neatly stacked with all the equipment and consumables for a particular service, so they have everything at hand. Beauty trolley carts come in a variety of shapes, sizes and utilities. Some are made of strong and durable metal and some from wood or plastic. Either way, they are designed with the professional consumer, in this case the beautician, in mind. 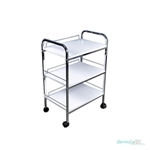 The trolleys come in all sizes with an assortment of drawers and compartments.